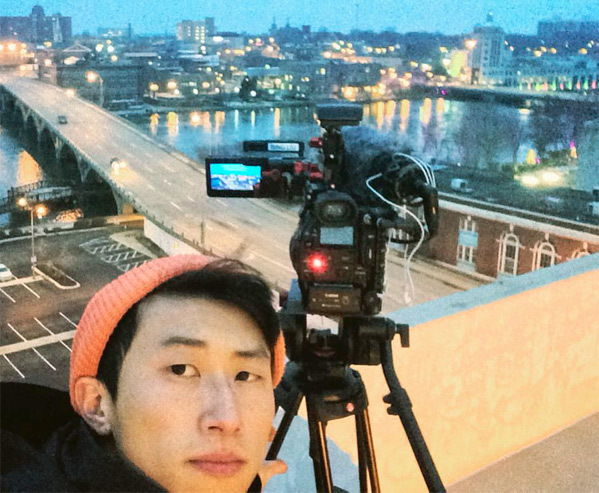 Of course, not many people know who Bing Liu is yet, which is part of the reason why I wanted to meet him. I want the world to know about him, and thankfully he's coming out of Sundance as one of the big names. Bing grew up making skate videos with his friends, then spent years filming them to make Minding the Gap. He has an eye for cinematography (such fluid shots in this), but also for storytelling, and the film has so much depth to it and nuanced moments of emotion that make it stand out. I wrote in my Sundance review: "Bing is the real deal, and he has made one of the most refreshingly original, engaging docs about growing up in today's America." I spoke with him about making this film and the choices he made as the filmmaker. 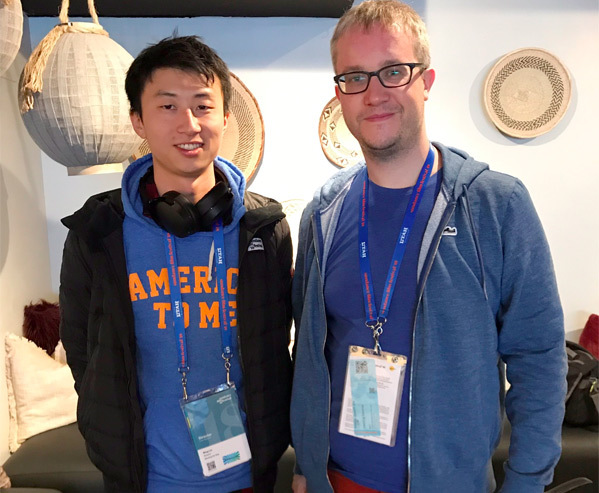 I met up with Bing Liu inside the media lounge on Main Street in Park City, Utah during the 2018 Sundance Film Festival. Like any passionate filmmaker/creator, he was still wearing headphones around his neck even though this was in the middle of the festival. Bing is a bit of shy, quiet, reserved filmmaking genius but I was looking forward to talking to him, hopefully to get a better understanding of who he is and how he was able to make such an outstanding film. I'm so glad I had the chance to meet him, and I'm sure Bing will be making many more superb films soon. He's a filmmaker to watch and I'm looking forward to following him. So to start - you have collected years and years of footage filming with all of them for so long. How did you start to form the narrative? How did you start to pull all of that footage together to create this film in particular, with these threads? I felt like I was cutting a lot of scenes together. Like a living room scene where people are arguing about white privilege. That was the easy part. The more difficult part was placing those sequences together, so I tried multiple combinations of those things. The two schools of structuring a vérité documentary like this is: do you edit for story or do you edit for issues. Right? So I just kept trying combinations of both. A part of it was thinking about it and analyzing it. But part of it was just seeing how, where the sparks hit. And having a lot of feedback screenings helped. Dragging my friends into my bedroom where I was cutting, randomly at times, helped get perspective. So by the time I brought it to Josh Altman, who I met on a different project this past summer, he watched the cut, he saw the bones of a really powerful documentary there. He cut another film that's at Sundance called Kailash. But I convinced him to come on as a consulting editor first. And he went through transcripts and built his own narrative through the transcripts on paper. And then I executed. And then finally he had a two month window where he could actually sit down and cut alongside me. So we rented a AirBnb in Venice and we would map things out on a real-time white board. That's basically a digital white board that's screen sharable. And we mapped stuff out and we'd agree on, yeah, let's try this narrative out. At first we did that just for Zack and Keire, so I actually cut a film with just Keire's story. Then I cut another film with just Zack's story. And then I tried to do one with my story, but that didn't quite work, so we shelved that. And we just got Zack and Keire's stories up and running. Zack's story we did first, because his story is more immediately trackable because there's this baby that's growing up and things are happening between him and Nina. And with Keire, it was a little bit more difficult. His struggle's a little bit more internal. Right? But ultimately we knew that we were building towards something, and that was self-realization, right? Everybody has a self-realization moment in the climax of the film. And we just needed to make sure that we built up all the necessary rafters to be able to prop that up by the end. And then when we went back to my story, we realized it was this meta puzzle thing that we had to do pretty carefully. I had tried multiple times before I met Josh to cut that interview with my Mom and it was always muddled. It was hard enough for me to cut my friends' stories, but to cut an interview with my Mom where I'm in it, that was difficult. So Josh re-did it and what you see in the film is basically, almost first try for Josh. And I was like "oh my God, I'm blown away." And so having that built up, we could build around that. How did you know you had the right feeling? Was there something with these cuts that you started to see in them, or could sense that it was getting to where it needed to be? Or did you bring other people in to check it out? What made the difference? Bing: Tons and tons of feedback screenings. That two month window where Josh & I were cutting together, we must have had seven feedback screenings. Very different audiences — some in Chicago, some in LA. Josh has cut many films in his career and he's had many films go to Sundance. But luckily for me even, I've had several feedback screenings where I — this was when I was just a one-man-band even before I met Diane Moy Quon, my producer. Those are some of the hardest things that a first-time filmmaker has to face — a feedback screening. So I slowly became less anxious with each screening and slowly began to realize how to get the best feedback out of it. But yeah, feedback screenings are essential to get out of your headspace, as well as working with an outside editor. So it sounds like you're a supporter of test screenings in general. Bing: Totally. I mean, this is a film about making sure you have a grounded perspective and getting perspectives outside of your own experience. And I think feedback screenings are that. How hard was it for you to put yourself in the film? Did you want to cut yourself out entirely? Bing: Josh was so frustrated with my story, when I first convinced him to do a consulting edit, he asked, would it be on the table for you to be not in the film? And I was like… maybe, but we've sold our two main funders on the fact that what makes this story complex is that it's multi-ethnic, and it's self-referential in this nontraditional way. So he was like, alright, we'll try… So yeah, we tried several versions. Some that made me more uncomfortable than others. More uncomfortable in the sense of a filmmaker. I didn't want to use voice-over, but we tried it. I didn't want to put myself over the front of the film to set myself up as a character, because it takes away the enjoyment element of figuring that out yourself. Yeah, it's easier than a traditional, personal doc, because it's not about — it's not my story. It's my story in relation to others. That's what is so interesting is the balance with all of it - your story in relation to the others. I think it's important that you were a part of it, especially knowing you grew up with everyone else in it. And I agree with you — some documentaries I don't like the way the filmmaker puts themselves into it, it can be too much. Bing: Yeah, it's a delicate balance of being too self-indulgent, or it's confusing and muddled. And it's like, why are they there in the first place, you know? Or it's just a crutch maybe to tie things together. But luckily we somehow found a good balance. Can I ask — where exactly does the title, Minding the Gap, come from? Bing: Yeah, so skateboarding is 90% mental. If you can imagine, you can do something. You most likely will be able to do it. So we apply that same idea to growing up and bridging gaps between fathers and sons, and men and women, and daughters and mothers, and mothers and sons. Minding the gap is also the British tube announcement. Bing: So it evokes urban movement, you know. And finally — gaps in skateboarding in the literal sense. So it's just this vague poetic sounding thing. But I do like it. And the cinematography in this film is incredible, it's so fluid and smooth and glides along with the skaters. It was a joy to watch, and looks even better than other skating films I've seen. You've been doing this your whole life, right? Bing: Yeah, I've had a camera in my hand since I was 14. I'm 29 now. Didn't really stop shooting skate videos, even while I was making Minding the Gap. I worked in the camera department and in the lighting department. So that's very rare, also, to have an understanding of the lighting for film. But yeah, I learned from ASC cinematographers about what they do on set. And combined that with my DIY guerrilla skate instincts to have my own style, I guess, my own voice. I didn't go to film school. I went to school to become an English teacher, I wanted to become a writer at first. I guess all that feeds into my particular eye. Are you a big documentary fan? Do you watch other docs? Bing: I do. Jeremiah Zagar is one of my heroes. He did a film called In a Dream, in 2009, that not a lot of people have heard of. But it's one of the best documentaries of all time, I think. Are there any particular filmmakers, besides him, or other films that have really inspired you? Oh yeah, The Work was great. Bing: God, that blew me away. That just floored me. Yeah. I really, really like that film. There's such a fascinating opportunity in the doc world to do anything and everything. You can follow people and show raw footage, or craft a narrative, or make an agenda film, or anything. I love that openness to what you can present and affect people in a way. Bing: Yeah. Totally. And one of my favorite films also is Stevie, by Steve James. His second documentary after Hoop Dreams. It's my favorite film of his. Did you see Steve James' new film Abacus: Small Enough to Jail that got nominated for an Oscar this year? Bing: Oh yeah, I saw a rough cut of it when he made a rough cut. We have these rough cut screenings at Kartemquin. That's such a communal place, I love Kartemquin. Bing: It's a documentary production company in Chicago that did Hoop Dreams. They've been around since the '60s. But they're just this documentary community / production company that is the bastion of Chicago documentary filmmaking. And that makes all the difference you think? Having a community of filmmakes? Bing: Having a home? Yeah, totally. A lot of people do this in isolation or work in some kind of studio system and it's just a different feel, yeah. What kind of films do you want to make from here? What's next for you? Do you want to go into features? Bing: I want to continue making documentaries and move into scripted fiction films, because I think there's some areas of the topics I want to continue to explore that I think would work well, or even better, in the fiction side. It's just whatever is best for the project, for the story to be told. But I want continue exploring, what I feel like I have a special voice in, which is the Lumpenproletariat of our society which we access through skateboarding with Minding the Gap. But that's the most interesting and voiceless yet very important fabric to our society that that needs more exploration. I'm also glad you included some of Nina's story in the film, I felt like that was important to cover aside from the three main guys. She could've been lost in the mix but does get some good time in the story overall. Bing: Yeah, as we continued to edit and carved out people, we tried to make everybody more dynamic and give everyone an arc. Have you been able to see films like Chloe Zhao's The Rider yet? Thoughts? Bing: No, but Nathan Halpern, my composer, composed that film. My editor Josh Altman saw it at TIFF when it premiered. You know, I've seen other films like The Rider where it's a hybrid docu-fiction. Yep, exactly. I'm wondering what you think about those? Bing: That's something I want to explore more, too. I had a lot of fun in Minding the Gap exploring, sort of, changing the rules of the film itself. And I want to continue to mess with that. There's a lot of room for that. But yeah, I've seen films like The Rider. It's like real people recreating scenes from their community and their lives. And it's real, but it's not. Thank you to Bing Liu for his time at Sundance. And to Susan Norget PR for arranging this. 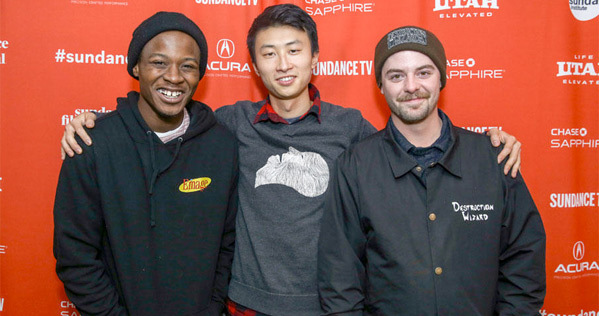 Bing Liu's Minding the Gap premiered at the 2018 Sundance Film Festival. It won a Special Jury Award for Breakthrough Filmmaking. It's currently finalizing distribution, we'll update when a release date is set. You can find out more info about the film and how to see it on their official website (or on Facebook). You can find out more about Kartemquin Films. And also read my review of Minding the Gap from Sundance here.